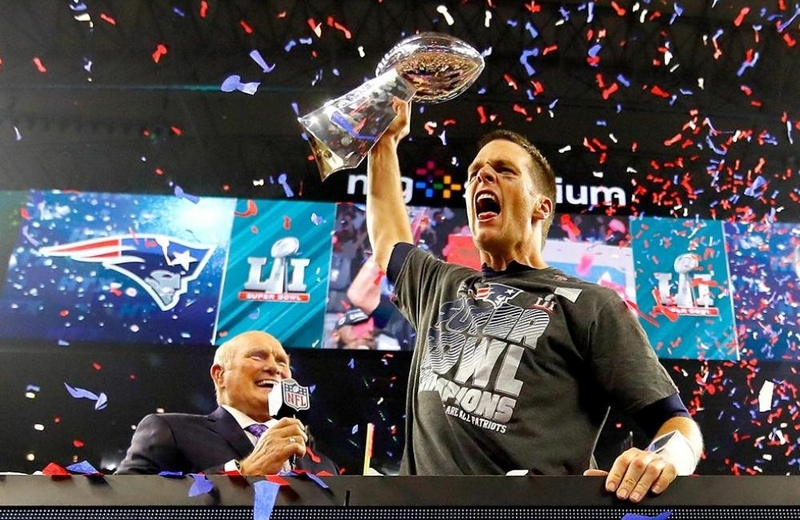 The media fire regarding Tom Brady’s unprecedented fifth Super Bowl title will continue burning for quite awhile, and only a mere 24 hours after his victory as I write this, you’re probably fed up of hearing the notion that he is the greatest quarterback of all time or at the very least sick of seeing the football and goat emojis flooding your InstaChat. But let’s face it. He is. And I’m saying that as a Jets fan. A Joe Montana fan. A Terry Bradshaw fan. As someone who has experienced more than a few deflating kicks to the ol’ green & whites over the years (so to speak) by Number 12. CBS Pittsburgh’s Colin Dunlap took to the media Monday morning still questioning the “legitimacy” of Brady’s career from the scope of him cheating, and while anyone is entitled to their opinion, I’m entitled to disagree. We’re in a world where everything is open to immediate analysis, interpretation and judgement. You’re still going to hang a little air pressure over the man after he just came back from a historic 25 point deficit on grandest, most watched sporting event America puts on year in and out? Even Goodell, someone who’s been notorious for his cover-ups, was practical enough to swallow that bitter pill and give Brady the weirdest handshake this side of Donald Trump. Dunlap’s opinion is sounding like less like opinion and more like sour grapes of being proved wrong Sunday night. To branch Spygate, Deflategate or Whatever-gate into Brady not deserving consideration of GOAT talk or ludicrously suggesting that we attach an asterisk to his name is either unfounded or just plain petty. “Cheating” if that’s what you really want to call this long dead horse is not new to this game of football, you know. Ask Mike Tomlin and his sudden case of December jimmy leg in 2013 against Jacoby Jones. Hell, ask any NFL era before it met Twitter, smart phones or the all-access benefit of Facebook Live. I’m sure John Madden’s Raiders has a tale or two to share about football morals with weighted and sticky hands. On top of that, I’m willing to wager Roger Staubach didn’t gripe about a pigskin’s weight to Pete Rozelle. He was a little pre-occupied with something called “The Steel Curtain”, who, if we’re tossing asterisks around all willy-nilly, allegedly partook in some “legal-at-the-time” performance enhancing substances. Going by Dunlap’s standard, we should asterisk that whole front four. Doesn’t seem too fair to do to “Mean” Joe does it? That, however, is just my opinion. And everyone has them, but how about we take a look at the facts about Brady? There’s quite a bit of positive ones if you decide to take off those rose-colored shades. Fact: He loves his teammates who in turn love him and credit his fiery leadership as a lighting rod for the locker morale and mindset. Fact: He’s never been apart of a dog-killing ring, steroid accusation (unless you consider electric pajamas steroids) or a domestic abuse allegation, something that in the long run will be more damaging to the game’s reputation than some text messages with an equipment manager will ever be, yet with Brady’s status, we’re quick to treat him on the same level. Fact: Oh, right. How could I forget? He has an unprecedented five Super Bowl rings. But sure. Let’s throw that asterisk up there.